With the increasing emphasis on text-based writing, students are expected to use evidence from multiple sources to support their ideas and claims. This process of weaving others' ideas into one’s own is a challenging one, not to mention a critical step on the path to higher levels of education. Students simply must learn how and when to cite their sources. That's where CiteSmart™ comes in. CiteSmart is an originality detection service that can be used when and where your students need support. 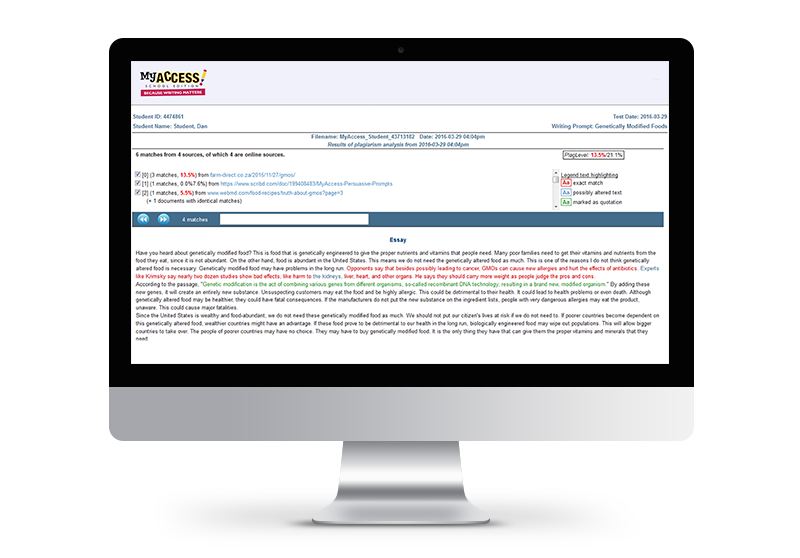 Add it to one of Vantage Learning's award-winning software applications, such as MY Access!, RubyWrite, or CorrectEnglish, or use it by itself. However you use it, CiteSmart will search the Web and its own proprietary database of essays to alert students to text that must be cited and guide them in the process. Choose the subscription that is right for you and register. Compose your document and submit it to CiteSmart. Review your CiteSmart Report and revise your writing.